This year - our fifth full season - the Five Lakes Silver Band enjoyed a very successful set of concert presentations and contests. For the second straight year, the band was awarded the prestigious Hannaford Cup in Toronto, Canada. The band and individual band members provide very fine performances at the North American Brass Band Association contests in Cincinnati, Ohio. And at each of our series concerts this past year, we had requests from our audience members to "commit the music performed to an album". While recording all of this season's music would be an unwieldy undertaking, the band did decide to record several selected favorites from throughout the year. 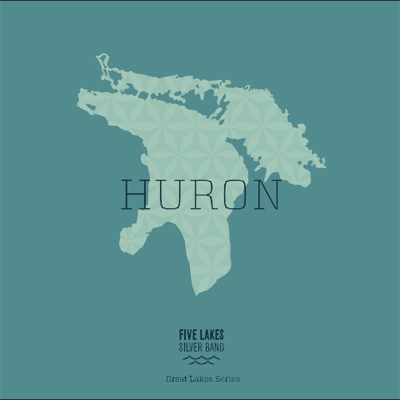 This album, Huron, is the result. We hope to make this the first in an on-going series of similar albums of favorite tunes. ​The folks at Saint John Lutheran Church in Farmington Hills, Michigan were quite instrumental in supporting the production of this album by make the church available to the Five Lakes Silver Band for our recording sessions. We thank our friends at St. John most sincerely for their support. ​In addition, we would like to thank the folks at the Salvation Army Citadel in Royal Oak, Michigan for their support. They have hosted many of our concerts and almost all of our rehearsals throughout the past season. Please accept our gratitude!